Elsie Gawler attended Maine Fiddle Camp as a camper for over 15 years and has since then transferred to teaching the cello at MFC. She grew up playing and singing traditional music with her mom, dad and two sisters and continues to play with them professionally as “The Gawler Family” band. 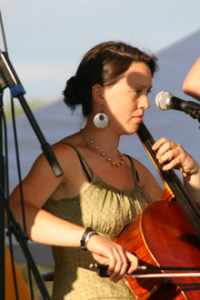 While the cello is her main instrument she also plays fiddle and banjo. She lives in Monroe Maine where she is the co-owner of North Branch Farm, a farm where they raise a variety of crops and livestock.